The LifeTime Java Shutter has been designed as the ideal solution for kitchens or bathrooms. Many years have been spent researching and developing so that we could provide the best Java shutter on the market. The LifeTime shutter has been engineered from hard wearing, lightweight Java, resulting in the strongest and longest lasting shutter you can buy. The LifeTime shutter is truly a revolution in Shutter manufacturing. 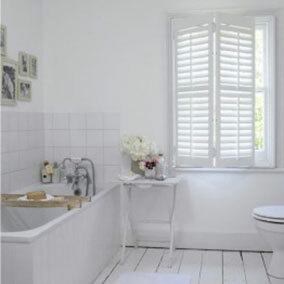 As well as being the perfect solution for kitchens or bathrooms the LifeTime shutter will look great in any room in your home. The extremely resilient and durable finish makes dents and scratches a rarity and maintaining and cleaning easy, soap and water is all it takes to remove marks and blemishes. The LifeTime shutter will never fade or turn yellow due to sunlight or exposure. The original colour will survive the life of the shutter – guaranteed. In fact we are so confident in the quality of our new product that we offer a comprehensive 5 year guarantee, so you can be sure your shutter will last a LifeTime.